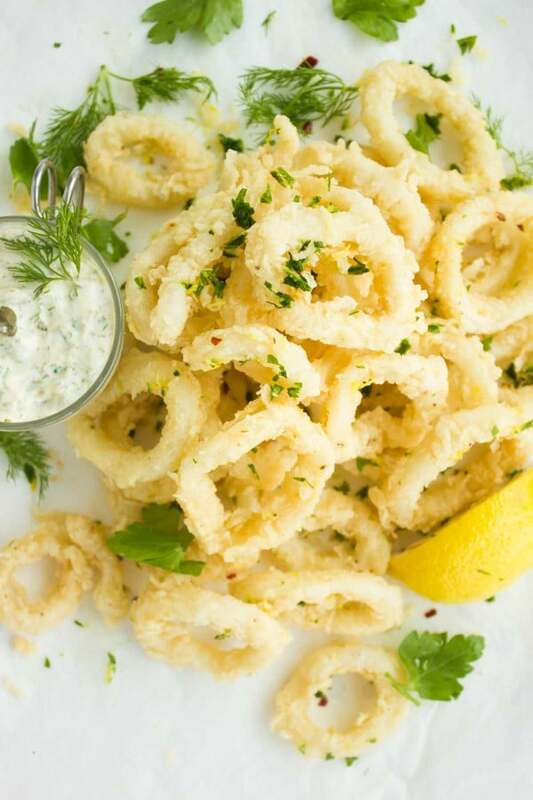 A zesty calamari with tartar sauce recipe is an essential one to have on hand—it’s an all time favorite snack, comes together in a flash and it’s loaded with seafood goodness. 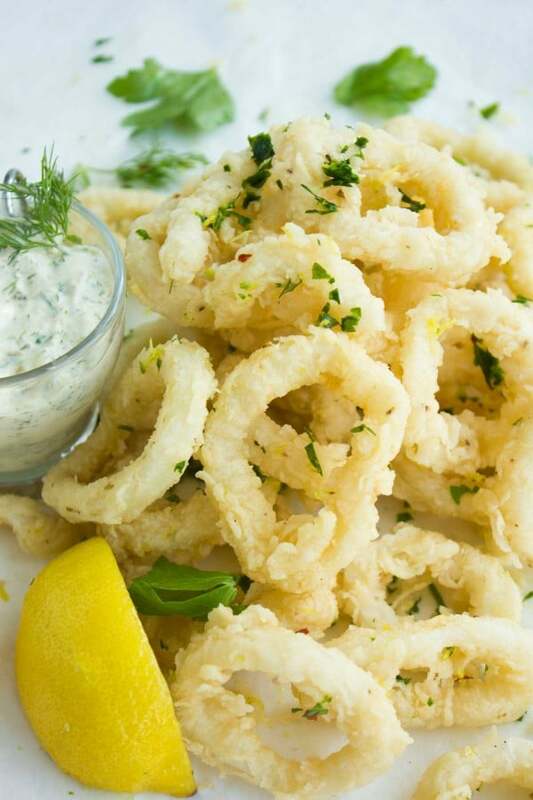 I love zesting up the classic calamari with plenty of lemon zest, herbs, pinch red pepper flakes and I serve it with a light as air sour cream dill tartar sauce for a refreshing feel. This is one of my must have recipes again, it’s a snack that you can’t get enough of and it’s super tasty. Mind you, I used to hate calamari when I was young, I just hated that oily feel in my mouth and the gummy rubbery feel of fried squid. The minute I overcame these, calamari turned into my go to last minute snack! So the trick is to fry them in small batches and not let them drink so much oil. In fact frying them for just 2 minutes is quite enough—more than that they will become oily, and even worse—they will become rubbery. It’s the same concept with shrimps, the more you cook them the gummier they become. And to fix that, you’ll need to over over over cook them with plenty of fluids for a while so they soften up a bit. But no matter how they soften up, they never have the same texture as the perfectly 2 minute cooked ones. 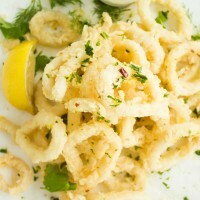 This is zesty calamari with tartar sauce have the perfect bite because they’re really fried for a couple of minutes only, and so they’re light in color as apposed to the deep golden ones (over fried or fried in oil that’s been over used). They’re soaked for 10 minutes in a milk-garlic-herb bowl to soften them and remove any strong squid taste. And finally they’re coated with one layer of flour so the coating isn’t too thick and you can absolutely taste the squid too. 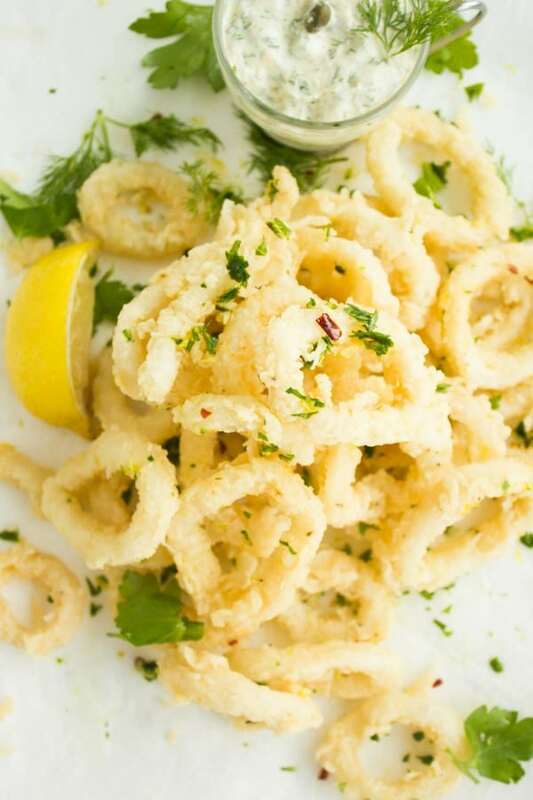 The trick to infusing so much flavor into these zesty calamari with tartar sauce is to actually sprinkle any flavor/spice/herb you like on them after they’re fried and while they’re still hot. This way they absorb so much of your spice/herb flavors and taste lighter and fresher than if they were just fried. My favorite way to zest them up is with a mixture of lemon zest, herbs, pinch of red pepper flakes and salt and pepper. 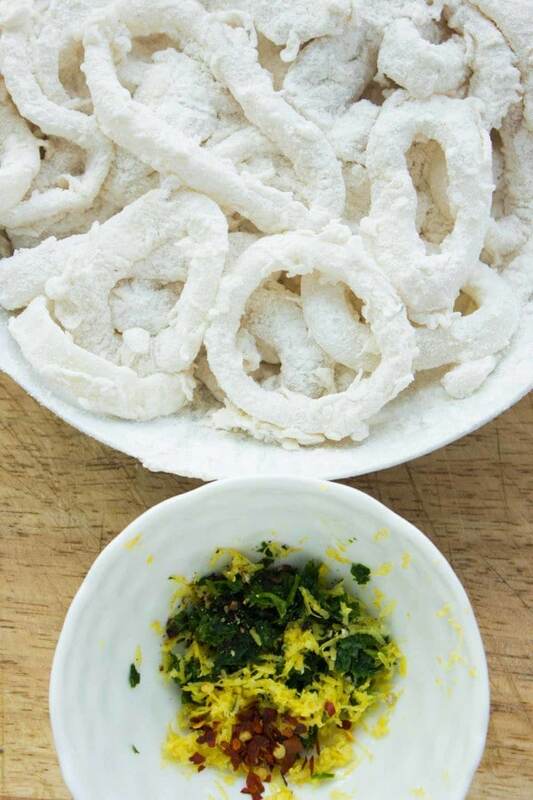 This tiny final step really makes your calamari stand out—so by all means don’t skip it, and by all means feel free to use your favorite spice/herb combo! 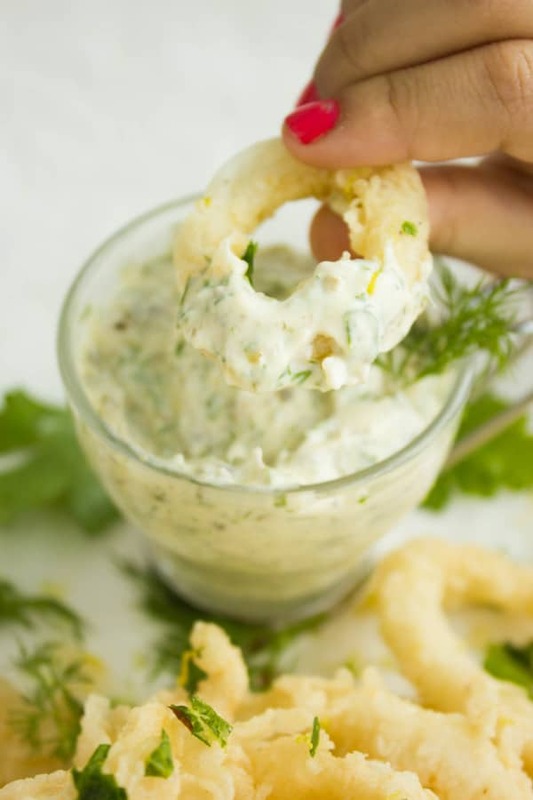 I love serving it with my light dill tartar sauce because it’s made with sour cream and is loaded with bright flavors from the dill, capers, parsley and mustard which adds an extra fresh feel to the calamari. 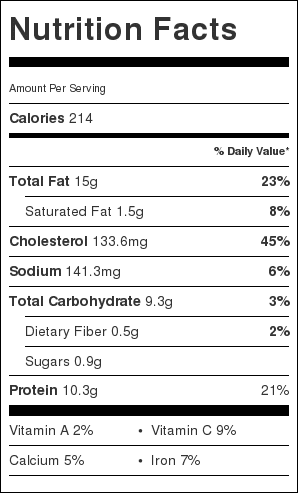 Heat up oil in a deep pan over medium heat until 375F is reached or use a deep fryer for convenience. In the meantime, pat dry the squid rings and soak them in the milk mixture for no longer than 10 minutes. Drain them well and place them in the flour bowl. Toss evenly and make sure each piece is well coated with flour. Remove the rings and fry them for 2-3 minutes or until cooked. Remove from the hot oil and place on paper towel-lined plate. 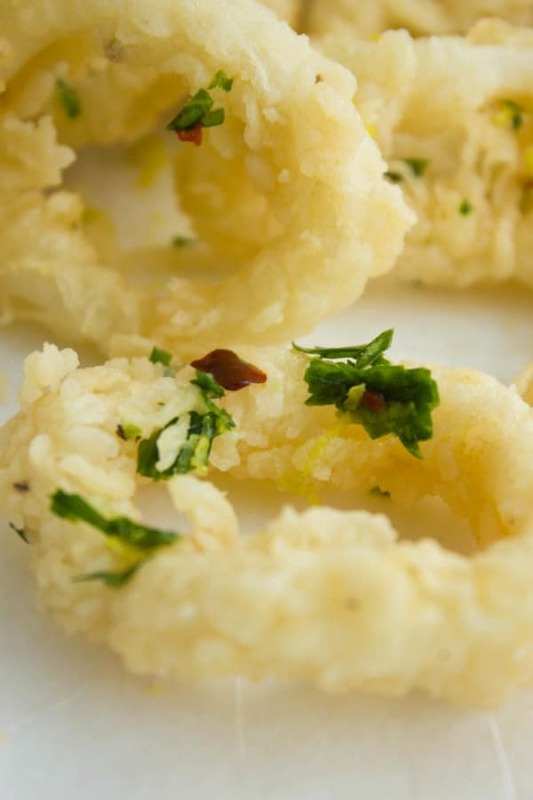 Immediately season the calamari with the zesty chili mixture and toss to coat evenly.